It’s that time of year again – the month of the hallowed sugar rush – Halloween. The good news is that there are ways to whiz past all those piles of goodies without falling off your UnDiet, AND without feeling deprived. Note to self: these tips work for any party or tempting situation, such as the office lunchroom. Don’t rely solely on will-power to avoid the platters of home-made bat-shaped Marshmallow Rice Krispie bars and jars of pumpkin shaped candy-corn that are hanging out in every office reception area and kitchen this month. Instead, arm yourself with a purse full of UnDiet Halloween Treats. It’s much easier to leave the bowls of miniature candy bars alone when you can munch on a Caramel Chew instead. 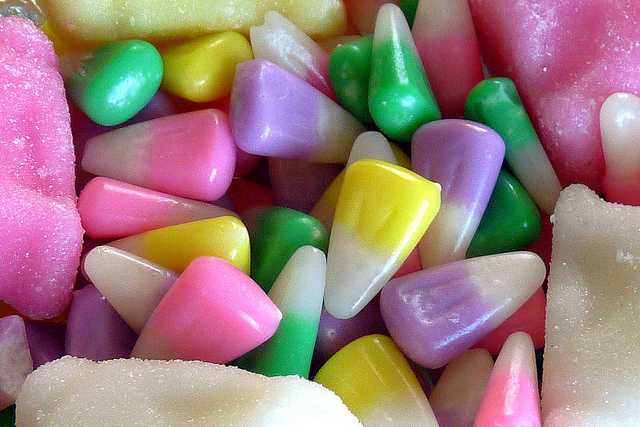 If you’re powerfully drawn to every bowl of candy-corn you pass, eat four of the little buggers, then move on. Don’t stand there staring at the bowl. Don’t analyze your craving. Don’t beat yourself up for wanting something that is coded into our genetic structure. It is. Really. Don’t try to figure out if you just gotta’ have one more. Just move on. Step away. Do it! Now! Stare at your naked or underwear clad body in the mirror. Relish the progress you’ve made losing weight, getting healthy and toning up. Ask yourself if you want to gain back any portion of your old body just for the temporary satisfaction of a handful of sugar. Remember how yukky it felt when you ate too much sugar; the sluggishness, the moodiness, the headaches … Now imagine yourself enjoying UnDiet sweet treats. Imagine enjoying guilt free Coconut-Almond Toffee Bars, indulging in Caramel Apples without gaining weight, munching on Honey Popcorn Bars without enduring that awful sugar rush and subsequent let down. Now do you still feel like snarfing miniature Snickers bars? Sandwich Platter: stack 2 slices of whole grain bread. Using Halloween cookie cutters to cut out shapes. Tip: if your kids are resisting whole grain breads try packing these in their lunchbox. What child could resist devouring a “spooky sandwich”?. All right, this isn’t one of the Bible’s official ten, but it’s definitely one of the successful UnDieters’ tools! After allowing your children to choose a designated amount of candy distribute the rest of their loot by filling gift bags to pass on to teachers, grandparents, hospital wards (don’t confine yourself to the children’s ward), nursing homes, aunts, uncles, elderly neighbors … It’s not the sugar that counts, it’s the thought. You could even include a cute note saying how sweet your connection to them is to tie it in with the candy theme. Now go forth and enjoy Halloween, no longer afraid of the next bowl of candy-corn lurking behind the door.